This is a nice Two Bedroom One Bath Lakefront Condo located in a quaint complex in the Horseshoe Bend area. The condo offers a queen bed in each bedroom and two double sofa sleepers in the living room ( 4 beds, Sleeps 8). Adjoining this condo is a large outside Lakeview deck with a gas grill and patio table to relax and enjoy the view. The Big Bear Resort Complex offers an Outdoor Pool and Hot Tub, a separate Swim Dock, Sand Beach, large outside decks and a laundry facility. 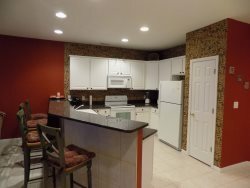 Located in the Four Seasons / Horseshoe Bend area this condo is close to all The Lake area attractions off of Duckhead Road at the top of the Horseshoe Bend Parkway. This complex is located close to The Historic Bagnell Dam Strip area, the Osage Beach Premium Outlet Mall and countless other Lake Area Attractions. Four Seasons, Seasons Ridge and The Cove Golf Courses are both very close to this condo. A boat slip is available for an additional fee.